To start up your computer just press its power button. The operating system loads automatically. At that point, the operating system’s desktop (or other interface) may appear, or you may be prompted to sign in. Depending on the operating system and the way it’s set up, you may be prompted to sign in by selecting a user account. If that account is password-protected, you will also be asked for the password. Where do user accounts come from? Well, one of them may be created automatically. The first time you turn on a new computer, part of the setup process may involve creating a user account. (That’s what happens with Windows systems, for example.) From that point on, you can sign in with that same user account each time you turn on the computer. If more than one person uses the same computer, you may want to create additional user accounts. To do so, sign in with an existing account and then use the procedure in your operating system for creating new accounts. 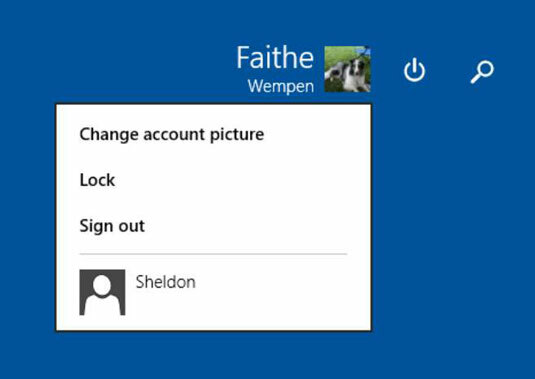 In Windows 8.1, you can create either a Microsoft account or a local account. A Microsoft account is linked to an email address; a local account is not. A Microsoft account has some advantages, such as the ability to access OneDrive online storage and to use the same settings (such as desktop colors) on different computers. A local account is private; it is on one computer only, with no record of it anywhere else. Windows 8.1 user accounts can also have one of two levels of authority: Standard or Administrator. A Standard account can run applications and can make changes that do not affect other users, such as choosing a different background image. An Administrator account has full permission to make changes that will affect other users too, such as to install and remove software and update device drivers. Not all operating systems allow multiple user accounts or require you to sign in; the operating systems on tablets and smartphones usually don’t, for example. Select the Settings charm and click Change PC Settings. Enter the person’s email address and click Next. Follow the prompts to enter any other information requested and complete the account setup. Shut down: This completely turns off the computer’s power; when you restart, the operating system must completely reload. Sleep: The computer goes into a low power-consumption mode that keeps only the memory powered; it appears to be off, but when you turn it back on again, it comes back up faster because the memory has remained powered. Hibernate: The computer’s memory content is copied to a holding area on the hard disk and then the computer’s power is shut off. When you turn it back on again, the stored data is copied back into memory; the computer starts up faster than from a complete shutdown, but not as fast ask from Sleep mode. Sign Out: Using this command signs out your user account and displays a prompt for someone else to sign in. 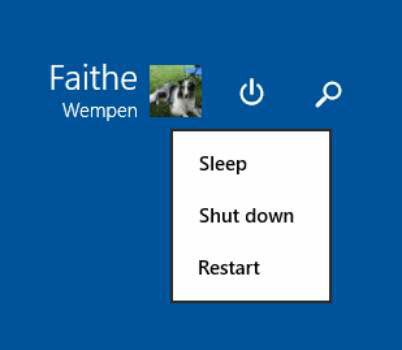 In Windows 8.1, you can access the Sleep, Hibernate (if available), and Shut Down commands from the Power icon in the upper right corner of the Start screen, and then choose the desired command. To sign out, you can click the currently signed-in user name in the upper-right corner of the Start screen, and then choose Sign Out from the menu.